Holiday season is in full swing and along with that comes all manners of parties and events and the requisite hostess gifts. 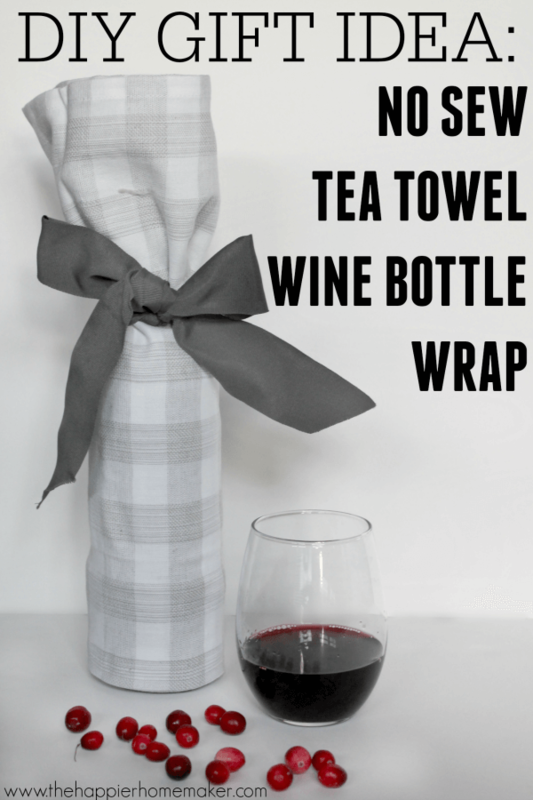 I love bringing my hosts a bottle or two of wine and today I wanted to share an easy way to dress up those wine bottles with a no sew tea towel wine bottle wrap. 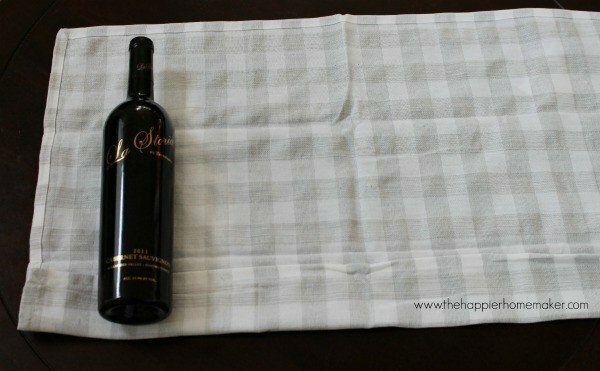 Not only will your host love the wine, they’ll have a pretty tea towel as a bonus! 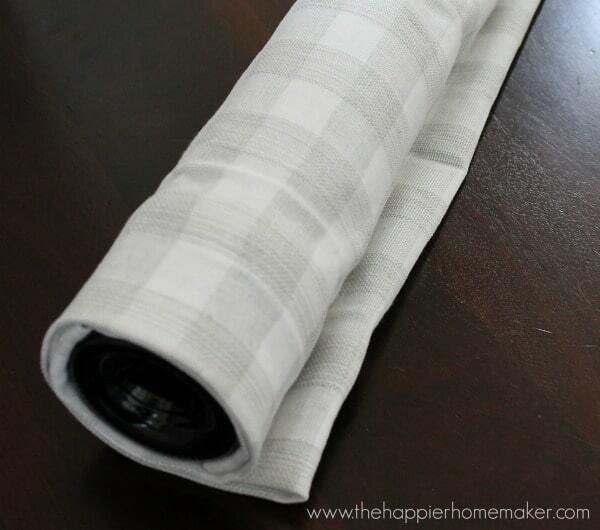 Lay your tea towel out on a flat surface. 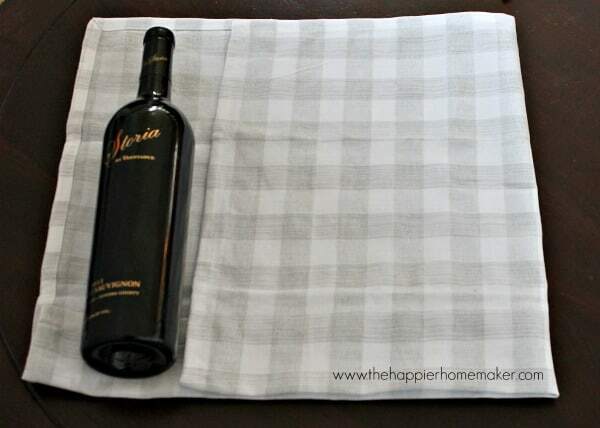 Fold the bottom edge up so that your towel is just about 3″ taller than your wine bottle. (The fold amount will vary depending on your towel size and wine bottle height. Lay your bottle on the left side of the towel and fold the right side over so your towel is approximately 18″ wide. This reduced the bulk of the wrap. Tightly roll the towel around the wine bottle being careful to avoid wrinkles. Secure the folded edge of the towel with two safety pins. Tie a coordinating ribbon around the top and you’re all set! This is a great thing to have on hand for neighbor gifts or in case someone stops by with a gift and you didn’t have anything prepared-you can excuse yourself for a moment and be back gift in hand and no one will be the wiser! 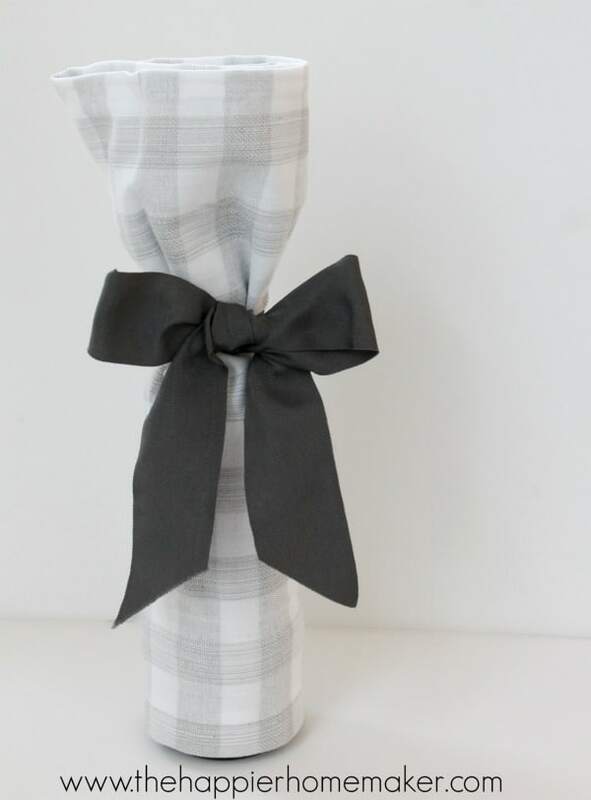 Do you have a favorite hostess gift to give? Do you keep a stock or buy individually for specific events? Let me know in the comments! “No sew” is my kind of DIY! Thanks for the great idea! So happy you liked it Robin! Have a great day! This is a genius idea. I am going to use that this weekend for a dinner party we are going to. We are a new DIY blog and love coming to your site for such great inspiration.